Nokia has launched some decent phones in 2017 so far if we talk about the budget price segment. The Nokia 6 has got one of the best builds among all the smartphones of its price range. Though it is slightly overpriced for what it offers, it’s not a bad phone at all. Nokia 5 is the lower end version of 6, and so is the Nokia 3 of the Nokia 5. Last month, Nokia 8 was launched, which is a high-end flagship with Snapdragon 835, Dual Cameras, Glass and Metal body etc. 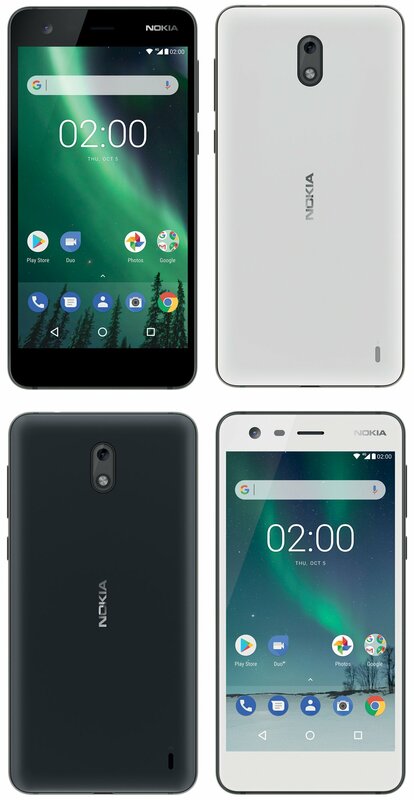 Soon, the company is launching an ultra-cheap phone named the Nokia 2, and it was leaked previously in the drawings that revealed the design of the smartphone. Today, Evan Blass revealed the press renders of the phone in Black and White colours that give us the best look at the phone so far. First thing first, the phone has no fingerprint scanner at all, and there are now on-screen buttons unlike the touch capacitive keys on rest of the Nokia phones. The phone has a plastic build, a rear-facing speaker, micro USB Port, a rear camera with LED flash and also a front-facing camera. Talking about that display, the Nokia 2 has got the same 5-inch Display as on the Nokia 3, and this was revealed by the drawings of the phone that surfaced a couple of months back. Recently, it was revealed that the Nokia 2 has a huge 4,000mAh battery. So, because it is a super cheap phone with 720p display, the 4,000mAh battery will be enough to keep the phone ON for more than a day. It is also rumoured that the phone has a Snapdragon 210 chipset. What do you think about the device? What should be the pricing? Do let us know via the comments section.